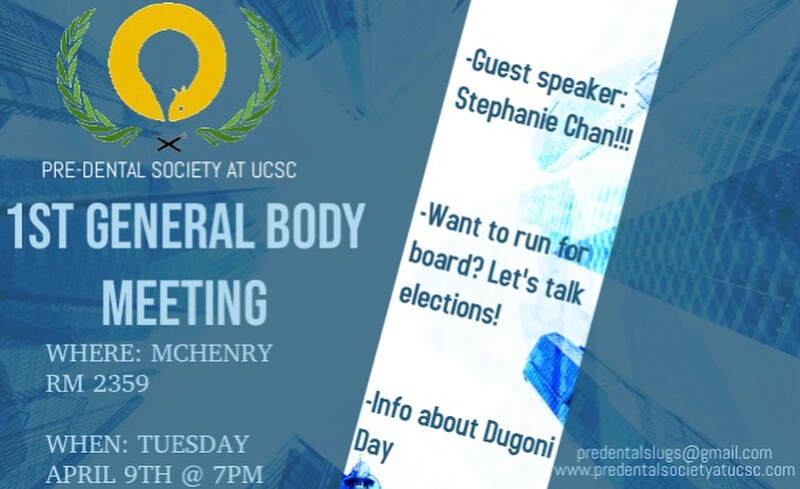 This Tuesday will be our first General Body Meeting for Spring quarter☺️ And what better way to kick off the quarter than with guest speaker, Stephanie Chan!!! She is an admissions coordinator for University of the Pacific and will be talking about their dental program. We encourage you all to come and say hi! ​Join us this Friday, November 16th at 7pm to celebrate our annual Friendsgiving Day! It will be a fun-filled night with friends, laughter, games, and delicious food. 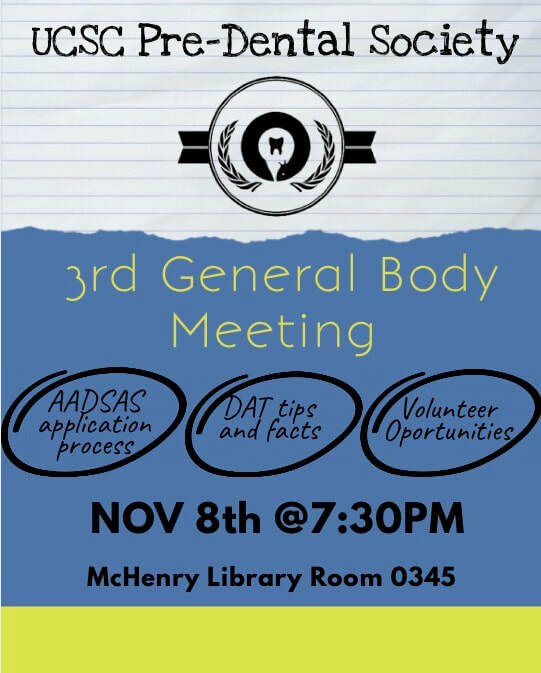 In our next meeting, we will talk about the AADSAS application process, DAT tips and facts, and also a potential volunteer opportunity. Join us at our first general body meeting for the 2018-2019 year! 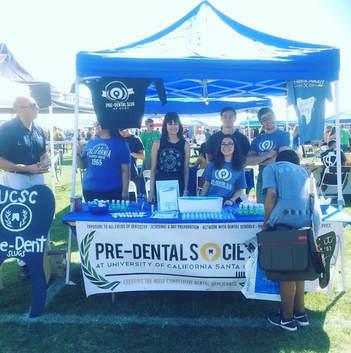 Why: Learn about our Pre-dental Society and Meet our 2018-2019 Board! ​Come find us at the 2018 OPERS Fall Festival on September 26th from 3-6pm. 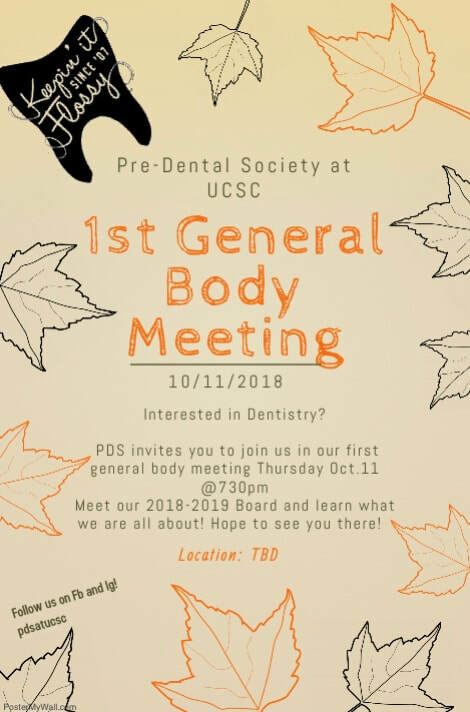 Meet your fellow Pre-Dental slugs, learn how to become a member, and stay tuned for our 1st meeting of the Fall 2018 quarter. Onsite Dental will be with us at OPERS. Onsite Dental is an independent dental practice providing high quality, full-service dentistry conveniently on campus. UCSC students, faculty and staff will have access to dental exams, cleanings, X-rays, fillings and many other services without having to leave campus.